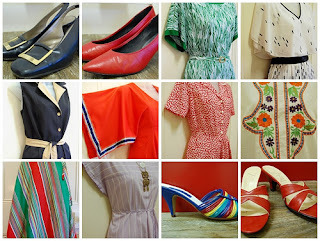 wardrobe remix, originally uploaded by paperstringcloth. Mustard cardigan from thrift shop, accented with vintage cloth covered buttons by me....grey jersey button down henley top from Cotton On (chain store), handmade black cotton wrap skirt with red pinstripe lining, made by me..... and my new fabulous $3 thrifted brazillian woven leather slingback wedge flats! Also included; A Concise History of Modern Art by Herbert Read, my vintage suitcase collection and my partner's vintage Apple Mac collection! It's amazing how difficult it is to take a decent photograph of yourself, I am actually not very photogenic, so I have to take millions of shots before I get one where I'm not pulling some kind of pained-looking expression....! 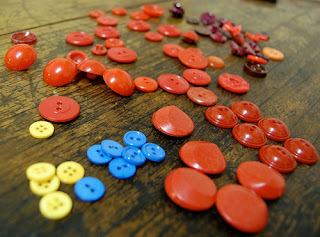 A big haul of vintage buttons, which will help me when I go to send off my button swap package this week! 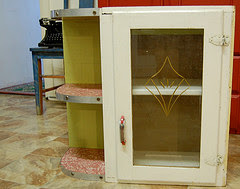 Plus a bit of a renovation project; this 50's corner unit with one cupboard and three shelves, cute etched glass door, and pink laminate...$10! I think a coat of paint and a good clean will have this one ready for installing in the hallway, where we need somewhere to dump our keys, the mail, etc etc. I also bought a whole stack of other things, knitting needles, some plastic beaded necklaces, some fabric remnants, but I won't bore you to death with ALL the photos! I've been doing a bit of work on my studio, which is looking much more organised, but somehow I don't think I'll be satisfied until I convince myself that I really DO need that fabulous big, roomy white bookshelf I saw in IKEA the other day.....It really would look perfect with all my new jars of sewing notions, my neatly folded and stacked fabric collection, and the storage boxes now stuffed full of vintage dress patterns........ la la la la ......the ways we justify spending money we don't have!